The Horai Dragon is the protector of seasons. This loveable dragon loves them all and knows the importance of having all four in Dragon City. This is why she goes out of her way to make sure not a single one is in jeopardy. Horai is not Currently Breedable. Sorry. Horai is a Legend primary element dragon and so can only be critical hit by other Legends. Avoid using Physical based attacks against Horai as they will have a weak effect. 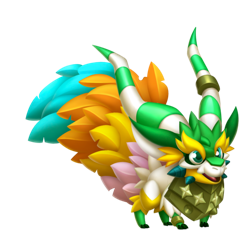 To beat Horai use high category dragons with strong attacks, higher level, and/or lots of stars!